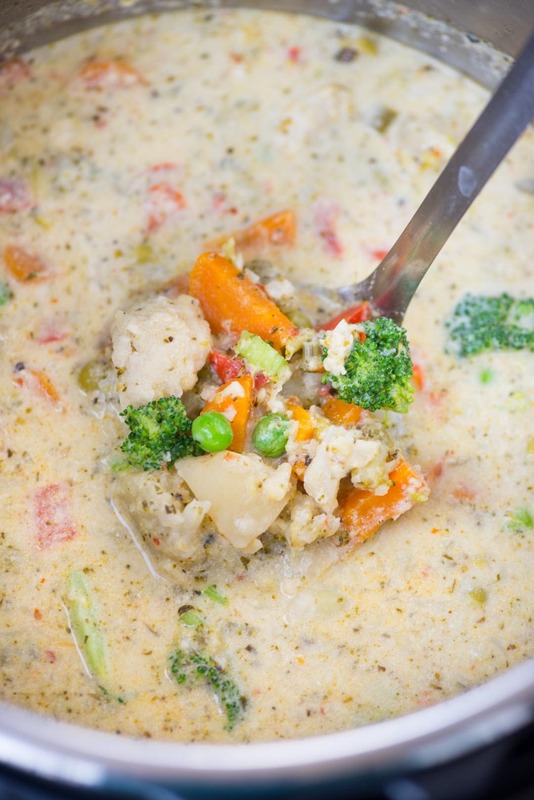 Creamy Vegetable Soup made with loads of vegetable is healthy and gluten-free. The soup has the richness from Parmesan Cheese and is really filling. There are instructions to make this soup both in the Instant Pot and Stovetop. 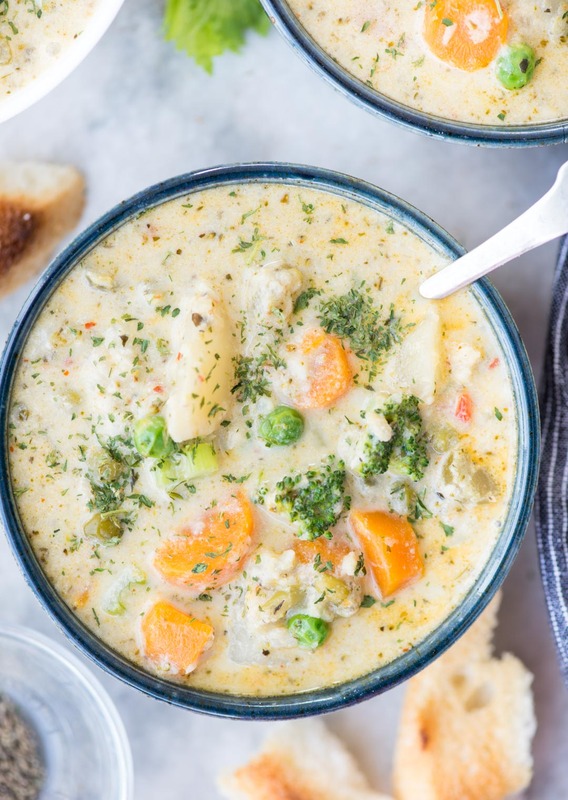 Made with an array of colourful vegetables, a bowl full of this Homemade Creamy Vegetable Soup is going to keep you warm on cold winter days. I have not used any flour or cornstarch to thicken the soup. It is partly thickened with cooked vegetable. Then for extra richness, I have added evaporated milk and parmesan cheese. You can pretty much adjust the amount of Cheese for low calorie and more healthier version. 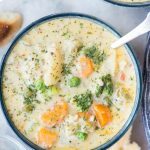 I have made this soup in my Instant Pot to speed up the process but you can easily make it on the stove top. I am going to share both the versions below in the recipe. 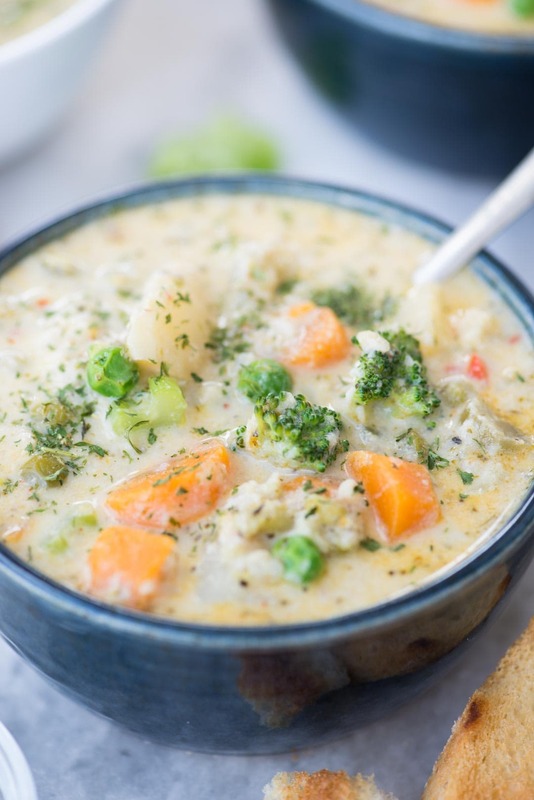 In either way, you can serve this delicious Creamy Vegetable Soup for dinner under 30 minutes. It is a great soup to use any leftover veggies. You can add any of your favourite veggies to it. I have used carrots, broccoli, cauliflower, peas and potatoes here. You can use corn, mushroom, zucchini etc too. 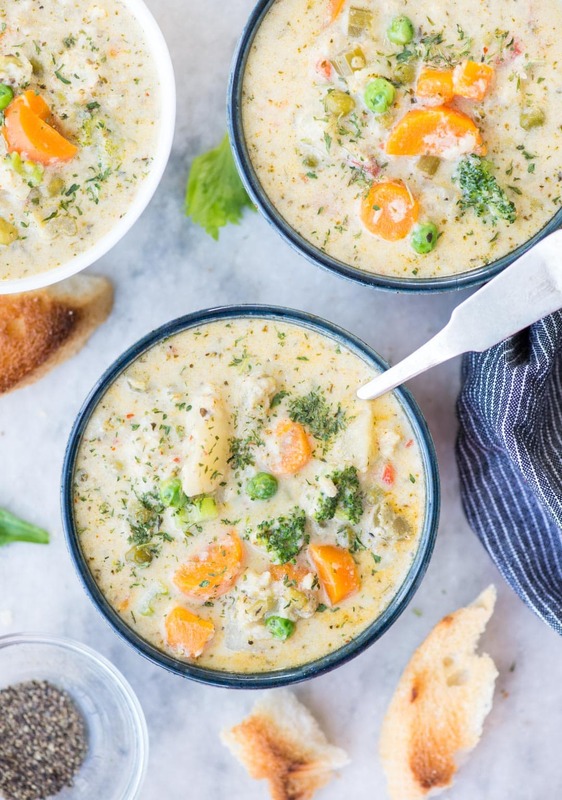 Dunk a crusty bread into this Creamy Vegetable soup and I am telling you it is a real bliss. This Healthy Vegetable soup doesn’t have any flour or thickening agent. It is naturally gluten-free. Cauliflower, broccoli and potatoes once cooked, helps to thicken the soup. You can adjust the amount of milk and cheese to be added if you are counting your calories. Switch on the Instant Pot and set to Saute mode. Add oil and butter. Once warm, stir in chopped onion and minced garlic. Saute for 1 minute. Add cauliflower, carrot and potato. Saute for a minute. Add Bell pepper, Broccoli and peas, followed by the seasoning, Chili flakes, salt and pepper. Pour in the stock. Mix everything well. Cover the lid. Set the Instant pot to Manual/Pressure Cooking mode. Cook for 5 minutes. Then let the pressure release naturally for 10 minutes, followed by manual pressure release. Stir in evaporated milk and Parmesan cheese. Mix until the cheese is melt and mixed well ( Don't overmix else the veggies will become really mushy). Serve hot with more parmesan cheese sprinkled on top, along with a crusty piece of bread.